Summit talks, meetings on nuclear inspections to take place soon. With the leaders of US and North Korea expected to meet soon for a second summit, the two countries are set to restart negotiations on nuclear inspections. 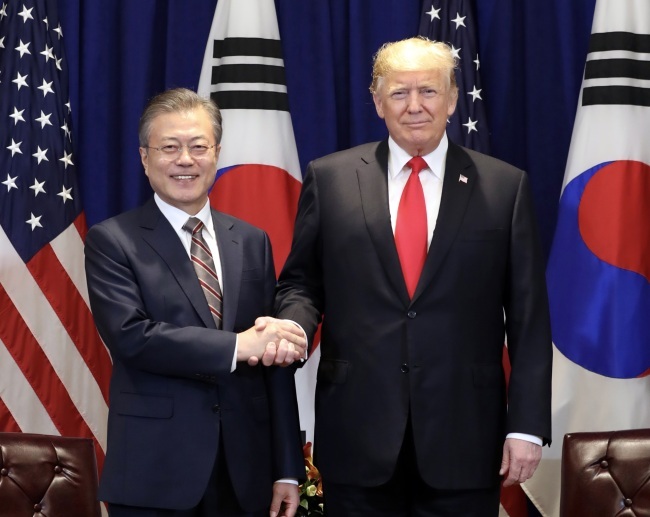 Trump made the comments after talks with President Moon Jae-in in New York, during which Moon conveyed Kim’s proposals to Trump including the date and location for a second summit. Moon’s meeting with Trump follows his three-day trip to North Korea last week. The inter-Korean summit was packed with events such as Moon’s speech to 150,000 North Koreans at a stadium in Pyongyang, and a visit to Paekdusan by the two leaders and their wives. “Chairman Kim has been really very open and terrific, frankly. And I think he wants to see something happen,” Trump said at an appearance with Moon on Monday in New York. “We are in no rush. There’s no hurry. … We’ve made more progress than anybody’s made ever, frankly, with regard to North Korea,” he said. US Secretary of State Mike Pompeo told reporters that he hoped to fly to Pyongyang soon to prepare for the second US-North Korea summit. As the US midterm elections are slated for Nov. 6, some observers speculate that Kim is likely to have proposed a meeting with Trump in October in Washington. The date and venue of the second summit are expected to be determined around Pompeo’s fourth visit to Pyongyang. Pompeo is scheduled to meet with North Korean Foreign Minister Ri Yong-ho in New York on Tuesday to discuss details of the summit. Moon emphasized that as Kim has expressed his willingness to denuclearize in front of the whole world, Pyongyang’s decision to give up nuclear weapons has become officially “irreversible” in the North. Trump, however, has not mentioned the “corresponding measures” of the US, which the North has demanded in return for permanently shutting down its nuclear facilities in Yongbyon. US diplomats and experts have warned that North Korea wants to go straight to Trump so that it can get significant, symbolic agreements like a peace declaration, without any details on the dismantlement of nuclear weapons. After the joint declaration by Moon and Kim in Pyongyang last week, Trump tweeted that Kim has agreed to allow nuclear inspections in his country. It is still uncertain whether by “nuclear inspections,” Trump was referring to the North’s reporting of its nuclear weapons, facilities and materials, and verification by international experts. Observers in Seoul believe Moon has conveyed Kim’s road map on what denuclearization measures the North will take by January 2021, a deadline Kim declared earlier this month. Following last week’s inter-Korean summit, Pompeo issued a statement saying that the US was prepared to “immediately” engage in talks with the North through a meeting between himself and Ri on the sidelines of the UN General Assembly this week. He also said North Korea has been invited to a meeting with US Special representative for North Korea Stephen Biegun in Vienna, where the International Atomic Energy Agency is headquartered. The two sides are expected to start discussing the technical details of nuclear inspections there.